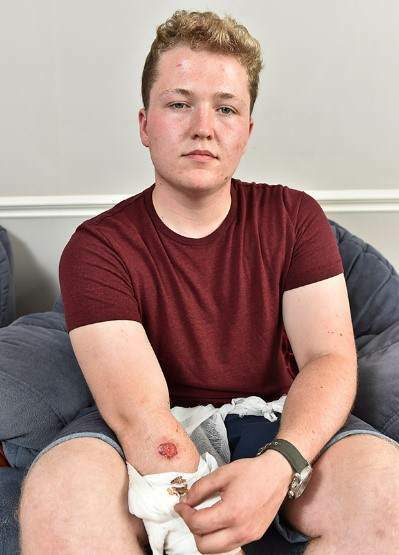 A teenager was badly burned and now has a permanent scar after falling asleep on his iPhone in the United Kingdom. Jake Parker, an 18 year old teenager from Wokingham, Berkshire in England says his iPhone 5 badly burned him. Jake says that he was texting friends and looking at his Facebook page after coming home from a shift at his factory job when he fell asleep on his iPhone 5. When Jake woke up he had a painful burn on his forearm. The teenager says he knows the iPhone caused the burn because it was still “really hot” when he woke up and grabbed the smartphone. Jake went to a hospital for treatment after his burn became infected and was given antibiotics. He had to return to the hospital a short time later when his wound changed color and turned black. His burn which had become blistered then burst and left Jake with a two inch deep hole in his forearm where he was burned. Jake says he was in excruciating pain and at one point he could see the muscle in his arms moving through the painful two inch hole that he now had in his arm. Doctors who treated Jake at the hospital say they have never seen anything like this ever before. Doctors believe that Jake may have suffered a radiation burn from his iPhone 5. Jake who is now recovering has a large scar on his forearm for the rest of his life from the burn he received from sleeping on his iPhone 5. Apple, the company that produces the iPhone has not commented or made any statements about Jake’s incident with the iPhone. So is there anything you can do to prevent yourself from being burned by your smartphone or other mobile device besides not sleeping on it? According to a Huff post survey conducted in 2013, 63 percent of smartphone users aged 18-29 drift off to sleep with a smartphone in their bed. In July of 2014 a 13 year old girl from Texas woke up when her bed was up in flames, started by her Samsung smartphone that was under her pillow when the girl was asleep. Putting your smartphone in a case will not only protect your phone it will also protect your from the risk of being burned and reduce the risk of fires should it be left lying on your bed or under your pillow. However the best way to protect yourself is to keep your cellphone at a distance from you and your bed when sleeping. Place it in a cabinet or on a bookshelf so you are not tempted to reach for it while you are in bed. Electronic device such as cellphones can also cause poor sleep quality if placed directly near the bed or under your pillow. The World Health Organization states that radiation emitted by cellphones can possibly cause cancer in humans. So the safest bet to prevent burns, fires, health problems and poor sleep from your electronic devices such as cellphones is to have them in an appropriate case and far enough away from you while sleeping so you are not tempted to grab them while in bed. I will be careful next time. It’s really a bad thing to happen with anyone.